The Toyota Hilux (or "Truck" as it was sold in North America) was the quintessential compact pickup produced by the biggest Japanese Megalocorporation. Toyota makes all manner of coma-inducing nannymobiles today but back in the mid '80s were bringing their A-game and the 4WD Hilux peaked with a one year only combo of solid front axle (for superior offroad articulation) and EFI (for better power, economy and smoothness). We named this one Jennifer after Marty McFly's girlfriend, and although it isn't black like Marty's truck it is a fine example and as close to the ultimate mini as we could hope to find on 24 hours notice. 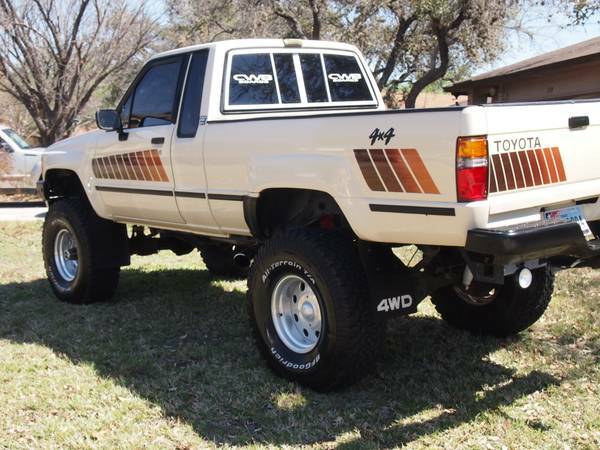 Find this 1985 Toyota SR5 here on craigslist for $8999 in San Antonio, Texas. Thanks to Andy L. for the tip! This one is not stock, but still very well kept and presentable. The slash graphics are probably originals to the truck but the "sweet" 4x4 decals on the bed sides are not. It's riding on big 35-inch BFG All-Terrain tires and Centerline polished aluminum 15" wheels - period correct, for sure. Not to mention the added capability when the crap gets deep. The seller claims an extensive list of recent work including engine rebuild, brake work, A/C components and suspension. 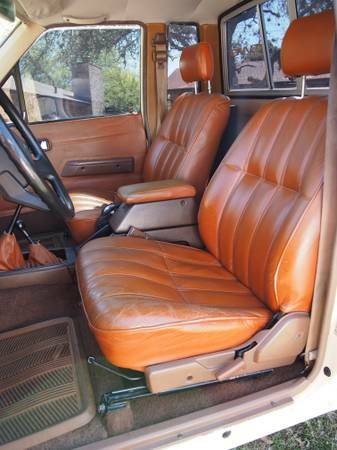 The interior is "custom" as seen below; it wouldn't be our first choice in a resto (original cloth would get the nod) but it looks clean and comfortable. The 112 hp, 2.4L 22RE engine won't make you cream your stonewashed jeans with power envy, but it is one of the most reliable and easy to service engines known to man. Murilee Martin calls it "warlord grade," we call it a solid piece of engineering (except for those pesky plastic timing chain guides). "Check out that 4x4. That is hot. Someday, Jennifer. Someday. Wouldn't it be great to take that truck up to the lake? Throw a couple of sleeping bags in the back. Lie out underneath the stars." This feature is part of Daily Turismo's birthday celebration of 50 cars in 24 hours..
That is lovely. 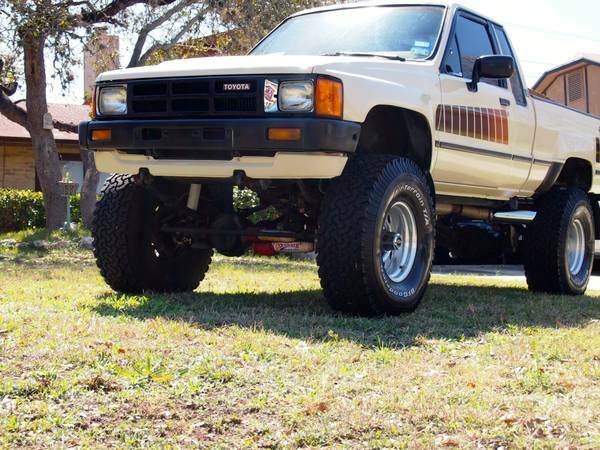 $9k seems pretty steep but I've never priced out the rare SFA 4x4s before. 85s are the holy grail as they are both solid axle and Fuel Injected. 1984 they were carburated and 1986 1st year of Independent Front Suspension. Regardless of the year these 1980s toyotas are slow but Stout and Over Engineered. 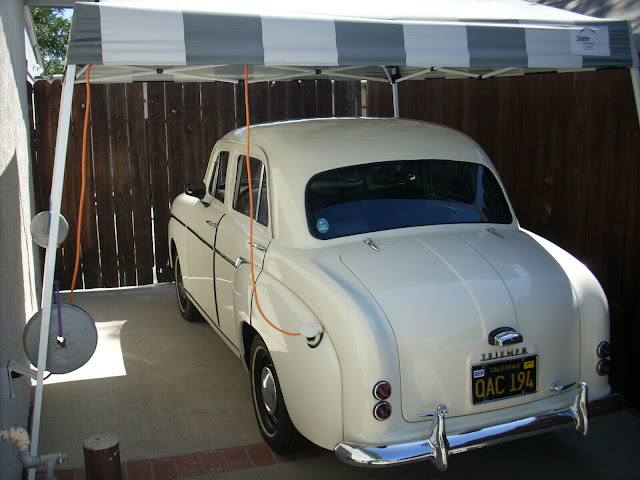 The front/rear axles are the equivalent of Dana 44 axles (what comes stock on Jeep Rubicon). Also they come with a Gear Driven Transfer Case- not belt driven as all new 4x4s nowadays. Fully boxed frame, 4.10 gears stock (depending on year configuration) pretty much a military vehichle for consumers.